Peanut butter is a favorite thing around our house. Even with the pugs. 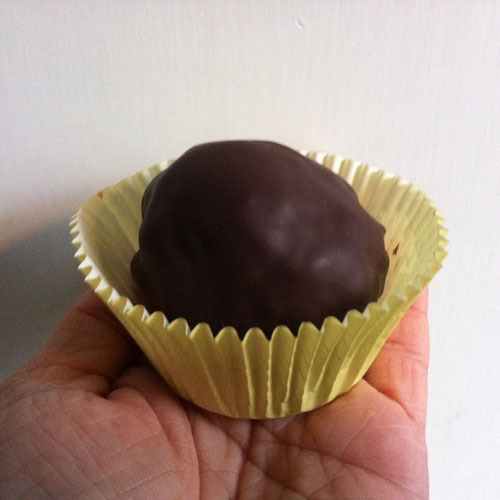 For some reason I never thought to try making one of Aaron's favorite treats... buckeyes, aka - peanut butter balls, but then I googled it. I found a recipe right on the Kelloggs Rice Krispies website. Turns out they are easy and fast to make. Wait - no, no. They are incredibly complicated and time consuming. But I will make the sacrifice and try to make them once in awhile. Meredith - I was sorta embarrassed to discover how easy they are to make! This is always on my Christmas Cookie list. My 2 cents: always use butter (better flavor than margarine); no need for the shortening if you're using candy melts because it includes wax already. I usually use Ghiradelli chocolate, so I add a bit of parafin wax to the pot.